Avocado is a fruit that has found impetus among people in the last few years, due to revelations about its health benefits. The product has been in demand in the food industry and is also finding application in the cosmetics and pharmaceutical sectors. Looking at the vast business potential, Transparency Market Research has published a report on the global avocado market. The report is an extensive analysis of the prevailing and future trends in the global avocado market. Further, it provides detailed insights into the potential drivers, crucial challenges, growth predictions, key strategies adopted by the major players, and the geographical analysis. 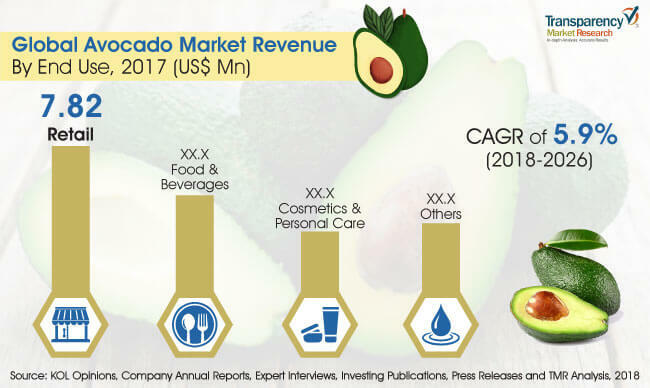 According to TMR analysts, the global avocado market was valued at US$13.64 bn in 2018 and is predicted to attain an overall value of US$21.56 bn by 2026. The market is projected to grow a healthy CAGR of 5.9% every year during the forecast period of 2018-2026. Competition in the global avocado market is strong as many new players are entering the market. Considering it is a perishable commodity, the scope for growth and expansion is very high in the global avocado market. Organic strategies like acquisition of regional players, launching new operations, and expanding the product line are some common efforts to sustain in the competition. Geographically, Latin America is believed to lead the global avocado market and North America is expected to stay a close second in the league. Factors such as rising awareness about health and importance of consuming natural food products is driving demand in the avocado market here. Research has proved that avocado has high nutritional value. Rich in vitamins, it is a natural source of vitamin B, K, C, and E. Further, it is also a rich source of potassium, carotenoids, and phytosterols. With numerous nutritional benefits, avocado is preferred as a natural ingredient in several food products today. This is a primary reason for constant growth in the global avocado market. Further, it is gaining importance in the pharmaceutical and cosmetics industry. With its health benefits, pharmaceutical companies and cosmetic product manufacturers feel it could be a key ingredient in their products. Research is on to develop products based on avocado extracts and ingredients. This attracts demand in the global avocado market. Further, the fact that avocado is a natural source, it garners increased interest among consumers. While avocado can be consumed directly in its ripe form, food manufacturers feel it could be used in different variations to attract consumers. Several avocado based products such as jellies, jams, juice, dips, candies, chutney, etc. are being introduced across various cuisines to kindle the interest among people. Several players in the food market are exploring new products with the punch of avocado to open fresh avenues for business. These aspects are predicted to drive growth in the global avocado market. Further, research has proved benefits of using avocado on skin care products. Players in the cosmetic industry are introducing skin care products with avocado as a key ingredient. Positive results in terms of business hint at stable growth potential in this new arena. Thus, consumption in the global avocado market is believed to shoot up during the forecast period.